Formula One racing driver Lewis Hamilton MBE was born 7th January 1985. he has raced for the McLaren team. He was the 2008 Formula One World Champion. Hamilton was born in Stevenage, Hertfordshire, and at the age of ten, he approached McLaren team principal Ron Dennis at the Autosport Awards ceremony and told him, “I want to race for you one day … I want to race for McLaren.” Less than three years later McLaren and Mercedes-Benz signed him to their Young Driver Support Programme. After winning the British Formula Renault, Formula Three Euroseries, and GP2 championships on his way up the racing career ladder, he drove for McLaren in 2007, making his Formula One debut 12 years after his initial encounter with Dennis. Lewis Hamilton’s contract for the McLaren driver development program made him the youngest ever driver to secure a contract which later resulted in an F1 drive. In his first season in Formula One, Hamilton set numerous records, while finishing second in the 2007 Formula One Championship, just one point behind Kimi Räikkönen. He won the World Championship the following season, ahead of Felipe Massa by the same margin of a single point. Clinching the crown thanks to passing the dry tyre-shod Timo Glock in the wet on the final lap, to take the necessary fifth position. Following that, prestigious motorsport weekly Autosport dubbed him as Last Lap Lewis. He has stated he wants to stay with the McLaren team for the rest of his F1 career. Following his 2008 title Hamilton struggled with less competitive McLarens, and in spite of taking quite a few Grand Prix wins he was not able to challenge for the 2009 championship, and finished a close fourth in 2010, being in mathematical contention until the final round. At the start of the 2011 season Hamilton dismissed Red Bull Racing as “just a drinks company”.Hamilton began the season qualifying and finishing second in theAustralian Grand Prix, despite having to deal with a damaged floor on his McLaren.In the Malaysian Grand Prix, he qualified second and finished seventh on-the-road, struggling partly due to tyre wear and being tagged by Ferrari’s Fernando Alonso in the closing stages.Hamilton received a 20-second time penalty post-race for weaving whilst defending and unsuitable driving, which dropped Hamilton to eighth place.Hamilton took his first win of the season in China.He then finished fourth inTurkey,and second in Spain. Hamilton crashed out of the Canadian Grand Prix after colliding with team-mate Button. In Monaco, he qualified tenth after Q3 was red-flagged before he could set a competitive time due to a heavy crash from Sergio Pérez. During the race Hamilton received a drive through penalty after he bumped into Massa at the Hotel Harpin. Later on, Alguersuari crashed into Hamilton, breaking his rear wing; the race was red-flagged as Petrov crashed at the same time allowing his team to fix the car. On the restart he had a collision with Maldonado at Sainte Devote, which later he was given a 20 second time penalty for but it did not affect his finishing position.In an interview with the BBC Hamilton, said that he had been to the stewards five races out of six thus far in the season and felt victimised. When prompted why he had been to the stewards so much Hamilton replied “Maybe it’s because I’m black. That’s what Ali G says.” He later returned to the stewards and explained the joke and escaped further punishment. Hamilton took his third victory of the season at Abu Dhabi Grand Prix. At the Canadian Grand Prix, Hamilton collided with Webber at the first corner before rejoining behind his team mate. A few laps later Hamilton tried to capitalise on a mistake attempted to pass teammate Button who pushed the former into the pitwall causing Hamilton to retire with a broken driveshaft, both agreed that it was one of those things. In Valencia and Silverstone Hamilton finished fourth after holding off Massa whilst managing high tyre wear in the former and conserve fuel in the later.mInGermany, Hamilton took his second victory of 2011 as he held off Webber and Alonso.In Hungary Hamilton had five pitstops and a drive-through penalty for sendingPaul di Resta onto the grass as he finished fourth.He finished fourth at Monza after a race long battle with Michael Schumacher, who he refused to blame the German after his aggressive tactics. In Singapore Grand Prix, Hamilton caused an accident with Felipe Massa which left Hamilton needing a new front wing and a drive through penalty.Hamilton was accused by Massa of being “incapable of using his brain,” during a post race interview. Whilst the pair conducted interviews, Massa grabbed Hamilton’s shoulder saying “Good job, man, well done” which Hamilton responded by telling the Brazilian to leave him alone. Before the Japanese Grand Prix Hamilton insisted that he had not done anything wrong during the season. During the race Hamilton suffered a puncture before once again tangling with Massa; despite Ferrari pushing for Hamilton to be punished, Hamilton escaped a reprimand as he finished fifth. Hamilton later told Massa to “grow up”, after admitting that his Formula One career had driven over a cliff. In Korea, Hamilton qualified on pole position, ending a run of 16 consecutive pole positions for Red Bull. He led only until turn four on lap 1, where World Champion Sebastian Vettel overtook him and went on to win the race as Hamilton finished second. atthe inaugural race in India, Hamilton recorded the second-fastest time in qualifying, but was penalised three places on the starting grid, after a yellow flag infraction in Friday practice.Hamilton finished seventh after yet another incident with Massa which left the Brazilian facing the penalty as Hamilton had to replace the front wing.In Abu Dhabi, Hamilton qualified second and won the race.In Brazil Hamilton and Massa ended their feud as he retired from the race and finish fifth overall in the championship. Hamilton took pole position for the 2012 Malaysian Grand Prix, but slipped back to third place in the race. Hamilton remained at McLaren alongside Button for the 2012 season.Hamilton qualified in pole position for the Australian Grand Prix, but finished third after being passed by Button at the start, and by Vettel after pitting before a safety car. Hamilton again qualified on pole for the Malaysian Grand Prix, but in the race was passed early on by Fernando Alonso and Sergio Pérez, finishing third. Hamilton took his third consecutive third place finish in China, with Nico Rosberg and Button ahead. Hamilton qualified in second place in Bahrain, but during the race, a series of poor pitstops put him out of contention, and he finished eighth. Hamilton was also involved in a controversial racing incident with Rosberg, with Rosberg appearing to push Hamilton off track while he attempted to overtake. Hamilton qualified on pole position for the Spanish Grand Prix, but had to stop the car on track in order for a reputable fuel sample to be given post-qualifying. The stewards decided he had breached qualifying rules introduced after a similar incident involving Hamilton at the 2010 Canadian Grand Prix. Race stewards excluded him from the qualifying results,and demoted him to the back of the grid; but despite this, Hamilton finished eighth, ahead of Button, who had started in tenth. Hamilton achieved his first victory of the season at the Canadian Grand Prix – winning the race for the third time – after overtaking Fernando Alonso in the closing stages. Hamilton won the Hungarian Grand Prix on 29 July 2012 to claim his second win of the season.Hamilton, along with championship leader Fernando Alonso, retired from theBelgian Grand Prix after being involved in a multiple car accident on the first corner of the race. Romain Grosjean was deemed responsible for causing the accident and was given a one-race ban. Hamilton bounced back with pole position for the Italian Grand Prix, and led for the majority of the race to claim his third victory of the season and keep his hopes of winning the Drivers’ Championship alive.Hamilton again qualified on pole at theSingapore Grand Prix, but suffered a gearbox failure whilst leading the race. He also retired from the lead of the Abu Dhabi Grand Prix, before he won the United States Grand Prix in Austin.Hamilton’s season ended with another pole position and retirement in the Brazilian GP, when he was involved in a collision with Nico Hülkenberg while leading in the late stages. On 28 September 2012, it was announced after much speculation that Hamilton would be leaving McLaren after the 2012 season to join the Mercedes-Benz works team for the2013 season onwards, partnering Nico Rosberg after signing a three-year contract with the team. In his first race weekend for Mercedes, the Australian Grand Prix, Hamilton qualified in third and ended the race in fifth place. Hamilton finished third in Malaysia to take his first podium for the team, although Nico Rosberg was prevented from attempting to overtake him by team orders. At the following race in China, Hamilton secured his first pole position for Mercedes. At Monaco after being out-qualified by his team-mate Rosberg for the third successive race, Hamilton admitted that he was struggling to control the car under braking.Prior to the race, both Red Bull and Ferrari had lodged formal complaints against Mercedes for taking part in what was determined to be an illegal 1,000 kilometres (620 mi) tyre test. Neither Mercedes drivers received any punishment for the breach of rules, and Mercedes was given a reprimand. At the Hungarian Grand Prix, Hamilton secured his first race win as a Mercedes driver, the first British driver to win a Formula One race in a Mercedes works car since Stirling Moss did so at the 1955 British Grand Prix, at Silverstone. He won the race from an unexpected pole position, eventually crossing the line nearly 11 seconds ahead of second place finisher Kimi Räikkönen.By winning the Hungarian Grand Prix, Hamilton continued his personal record of winning at least one race prior to the mid-season break, and went into the summer break lying fourth in the drivers’ championship. 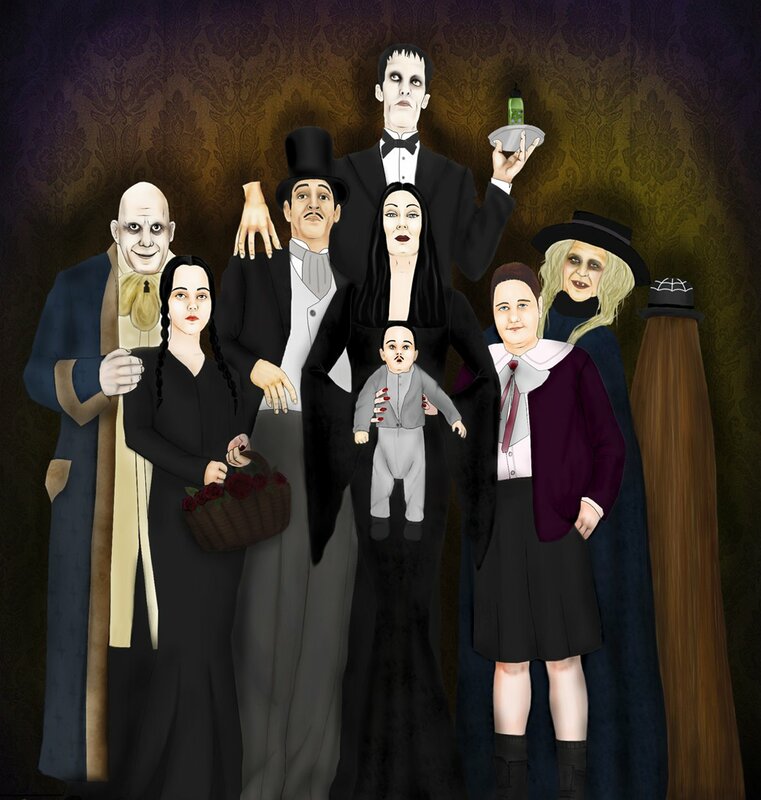 Some of his best known recurring characters, became known as The Addams Family, and The Addams Family television series began after David Levy, a television producer, approached Addams with an offer to create it with a little help from the humorist. All Addams had to do was give his characters names and more characteristics for the actors to use in portrayals. The series ran on ABC for two seasons, from 1964 to 1966. and also became the basis for two two animated TV series, three motion pictures, and a Broadway musical.